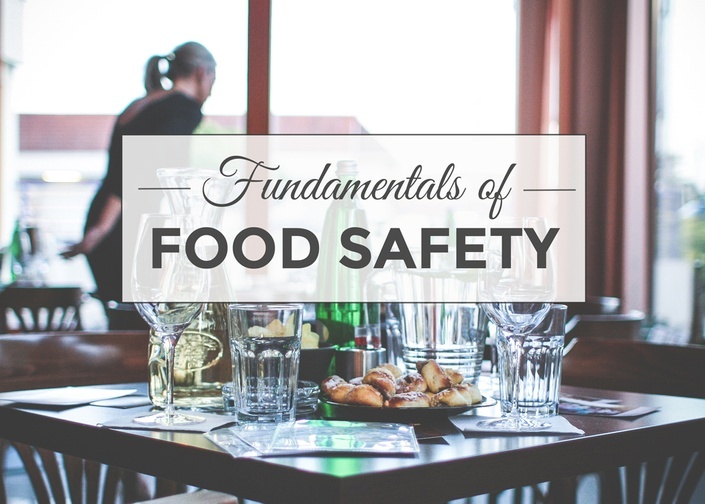 Everything you need to know to become a safe food handler and get certified! If so, it's important to protect yourself and others from getting sick by learning safe food handling practices! WHY DO I NEED THIS ONLINE COURSE? In accordance with the City of Winnipeg Food Service Bylaw: No person shall operate a food service establishment unless the person in charge has successfully completed the Certified Food Handler Training program. Food Service Establishments with less than 5 Food Handlers must have a person on staff who has successfully completed the Certified Food Handler Training program. Food Service Establishments with more than 5 Food Handlers working at any one time must have a person who has successfully completed the Certified Food Handler Training Program ON DUTY at all times. FUNDAMENTALS OF FOOD SAFETY is for you! The Registered Dietitians at A Little Nutrition have designed an ONLINE training course for you to learn the basics of food safety, and to be a certified food handler. "Dietitians are experts in food microbiology, food-borne illness, and safe food handling practices"
Sept 22nd @ 9:00 a.m.
Oct 13th @ 8:00 a.m.
Nov 7th @ 7:00 p.m. Please email admin@alittlenutrition.com to book your exam. We will arrange a private exam seating for you. Restaurant owners, managers/supervisors, front line staff, line & prep. cooks, staff who are responsible for receiving and storing food. Health care aides, home care workers, and care providers in long-term care homes. Has the ability to "learn at your own pace" anywhere or anytime! This course is easy to access, and convenient to use. Every chapter and unit has a slide show with videos, as well as written material to read along to. Test and apply your knowledge, or prepare for the written exam with our practical quizzes and pretest that have been designed to ensure you will be a confident food handler! "We want to help you reduce the risk of food poisoning at your establishment, which might be a restaurant, a food truck, bakery, grocery store, church, or daycare. This course covers the key areas in food safety to ensure that you won't be putting your customers at risk. " Want to get your Manitoba Health Food Handler Certificate? To receive your certification you must write an in-person written exam, and pass. You will then be awarded a Manitoba Health Food Handler Certificate. Passing grade is 70%, and you will have to allow 2-months for delivery of your certificate in the mail. Your certificate will be good for 5-years, and is approved by the Province of Manitoba Health Protection Unit. You can write the exam with us, or you can do the written exam with any local provider like Manitoba Health. A list of exam providers is also available in the course material. Get individual access to the course for 6- months, and write the exam with us! Check out our exam seating schedule listed in the course material. After you finish reading & listening to the course material, and do the practice exams, you'll be ready to challenge the Certified Food Handlers exam with the listed exam providers. Exam fees are between $36-$50. Susan Watson, RD: As a foodie and registered dietitian, Susan loves to be in the kitchen creating recipes and teaching others how to make delicious healthy food. She understands the importance of food safety as a mother and a professional. Susan is the owner of A Little Nutrition, and has formatted this course for you. The course starts now or whenever you choose to enroll! You get instant access to the course after your payment has been processed. You can finish the course when you want to at your own pace. After enrolling, you have 6 months access to this course - across any and all devices you own. How do get my Certified Food Handler Certificate? After you finish reading & listening to the course material, and do the practice exams, you'll be ready to challenge the Certified Food Handlers exam with the listed exam providers at your convenience. The fees for the written exam and to receive your Food Handlers Certificate are between $36-$50. See the list of challenge exam providers. You can also write the exam with us, and we will provide you monthly exam dates. What are the next exam seating dates in Winnipeg? We have a full list of partners who offer the challenge exam and you will get access to that list after you have registered. A Little Nutrition will be hosting our next exam seating on Sept 9th @ 8:30 a.m., Sept 27th @ 7 p.m., Oct 21st @ 8:30 a.m., Nov 1st @ 7 p.m., Nov. 25th 8:30 a.m., Dec. 13th @ 7:30 p.m. Exams are held at Birch Wellness Center, 34 Carlton Street, Winnipeg Manitoba. Email admin@alittlenutrition or call 1-204-792-1893 to book your exam seating. Do you offer private group or On-Site Exam Facilitation? Yes! Private group or on-site exams can be schedule to be written at the food service establishment or facility. What are your policies on refunds or no-shows? No-Shows will not be refunded or rescheduled. Refunds: We do not issue refunds for our e-courses once the order is confirmed and access has been given to the course. We do issue refunds for e-courses only under the following conditions: Major defects. All our products are tested properly, but unexpected errors may occur. We recommend contacting us for assistance if you experience any issues receiving or gaining access to the course. We are always there to help. Please contact Susan or Breanne and email her your questions.